Light and powerful: with a compact footprint and light carriage weight of only 16 grams, the agile Xaar 128 printhead is ideal for applications where weight and size are a key factor to design. Ease of integration: specifically engineered with a simple electronic interface, the Xaar 128 promotes quick and easy integration into printers making it the ideal choice for those wanting to enter into a variety of markets. The Xaar 128 has maintained its position as the leading 17 mm piezoelectric drop-on-demand printhead of choice for the Coding & Marking and Wide-Format Graphics (WFG) print sectors. Its 20 year proven track record of reliability, ease of integration, throughput, speed and quality of print have made this printhead continuously sought after for new printers. Whether its outdoor or indoor graphics, barcodes, outer case carton coders or poster printing, the Xaar 128 is compatible with many ink types. The compact and versatile Xaar 128 is used extensively for a diverse range of applications, primarily in the Coding & Marking and WFG markets because of its high print quality, resolution and range of variants. 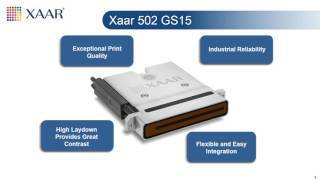 Recent manufacturing optimisations have enabled Xaar to provide the Xaar 128 with a programmable circuit which offers advanced control and tuning of the printhead as well as better control of ink characteristics and print quality.